My one peach tree planted in 2008, grown in a pot. To get quality fruit the small forming fruit must be culled to about 8 inches apart on each branch. There are numerous fruit and the job can be tedious. I do it over several days. I end up with from 50 to 100 quality fruit. A tree ripened peach is food for the gods. I am on the cusp of being able to grow peaches, since some years Spring frost destroys the buds. 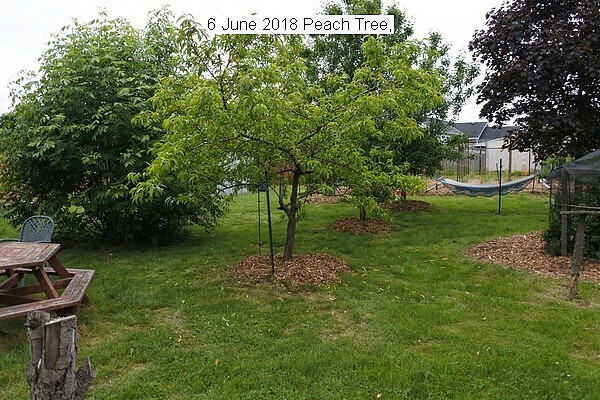 This entry was posted in Uncategorized and tagged 6 June 2018 Peach Tree (Redhaven), Peach Tree, Peach Tree (Redhaven). Bookmark the permalink.